This week the currency pair USD/CHF continues to trade in the downtrend. Today, the price has reached the highs since October 2011 at the level of 0.8712. Even weak statistics from Switzerland and Eurozone was not able to stop the rise in Franc. In January retail sales in Switzerland fell to 0.3%, while volume of industrial output in Eurozone amounted to -0.2%. Obviously Swiss currency is supported by instability in political situation of Ukraine. Franc has always been a haven currency and any instability in the world triggers demand for this asset. In the near future the price will slowly decline to the levels of 0.8686 and 0.8640. Note that the pair seems to be oversold; therefore upward correction is quite possible. Probability of upward correction is also confirmed by technical indicators. Bollinger bands demonstrate divergence; however the price chart has broken the lower moving average indicating a chance of correction to the level of 0.8766. MACD histogram is in the negative zone, its volumes are increasing. However between histogram and the price chart there are signs of “bearish convergence”, which shows probability of correction. Stochastic lines are in the overbought zone, they can cross soon and go upward. Important resistance levels: 0.8755, 0.8811 and 0.8873. Important support levels: 0.8686 and 0.8660. In the current situation it makes sense to open short positions with profit taking at 0.8660. 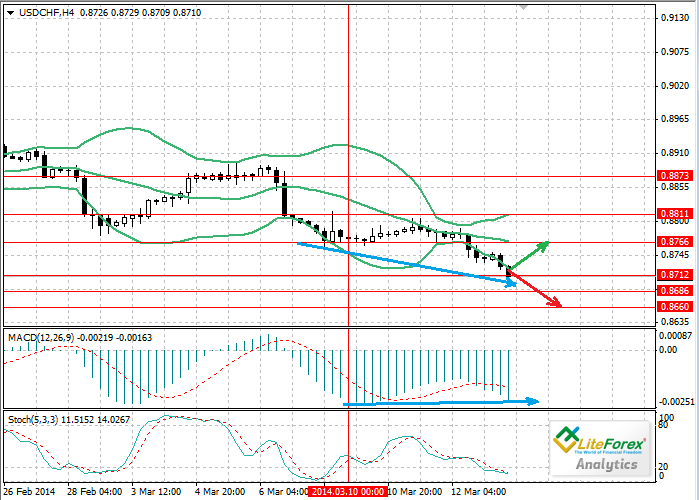 Long positions can be opened with the target of 0.8766, if the price goes above the level of 0.8735.